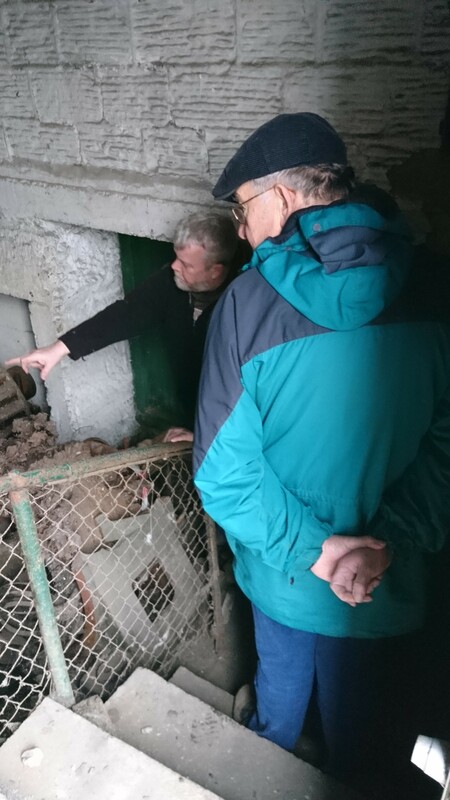 On Saturday 7th April the Friends of Hemingfield Colliery hosted a special open day visit from members of the Sheffield-based Time Travellers group of archaeology enthusiasts. The group had arranged a day trip to the Elsecar Heritage Action Zone area, being hosted by Dr Tegwen Roberts (Elsecar Heritage Action Zone officer), and filled a busy day visiting the Newcomen beam engine, exploring the buildings of the Heritage Centre, stopping by the Elsecar Heritage Railway and reviewing the archaeological research underway in the area and supported by Historic England. In the afternoon, Dr Roberts led the group of around 25 members down from Elsecar to visit Hemingfield Colliery, guiding the visitors along the Dearne and Dove canal towpath, past the Hemingfield Colliery basin and on to Tingle Bridge with its surviving lock-side public house, the Elephant and Castle. The morning had been somewhat damp, but by mid-afternoon the clouds, though still looming, mostly held off as the Time Travellers were welcomed to the pit after their approach from Tingle Bridge. A warm (and mostly dry) welcome! Waiting ready to receive the visitors was Friends Director of Volunteering and Community Engagement, Christine Cameron, together with Site Manager Glen Sheppard. Joining them for the group tour was regular volunteer Chris. Starting under the Colliery’s 1939/40 concrete winding headgear, the Time Travellers were taken back to the origins of the pit, and a brief overview of the lifetime of the workings, from the 1840s through to 1920; from 1920 through to Nationalisation in 1947, and from NCB Nationalisation on to the 1994 Privatisation and the final period before the Friends’ secured the site. Gathering opposite the winding engine house and facing the row of cottages behind, the key dates and earliest surviving features of the Colliery could be clearly shown and described. Critical to the story of this and most coal mines is the question of water – managing it for drainage – by pumping, and for raising steam – to power the winding and pumping engines. Central to the history of the site then, is the pumping shaft and Cornish pumping engine house which are remarkable survivors from the earliest days of the pit. After answering questions about the development of the site, the visitors were invited to head into the darkness of the winding engine house. Allowing eyes to adjust to the darkness, the Friends put on their own magic lantern show projecting a series of images on to the whitewashed wall and putting the details of the site into their wider context. Using historical engravings and photographs the present reduced pumping station sight was shown in its coal-winning prime, and its relationship to the canal and later to the railway were shown. Intrepid explorers and engineering enthusiasts venturing further into the historic winding engine house,with Site Manager Glen who explained the surviving winding engine equipment and the operation of the original vertical winding engine. And outdoor tourists guided around the excavated area at the rear of the winding engine house. Bringing the two groups together back at the top level, the Time Travellers asked some final questions, and were encouraged to feedback on how the trip had gone – where the Friends can learn from visitors to clarify, adjust and improve our tours and explanations. Many thanks to the Time Travellers for your interest and patience, and for Dr Roberts for safely delivering visitors back to Elsecar. We hope you enjoyed the visit to Hemingfield and the many Elsecar HAZ features which will continue to develop as the Heritage Action Zone Programme of work continues over the next few years.